There can be no bigger thrill than having a Black Rhino bull sense our presence on a Bush Walk. I accompanied Rex on a walk this January. We were walking through a dry watercourse when we heard the most terrifying bellow – Rex, who was ahead of the group, came charging back and ordered us in a most definite way to run along the dry riverbed and up a sharp incline on the opposite side (apparently Rhino struggle to climb sharp inclines). We did this extremely quickly and waited with bated breath to see whether the Black Rhino was in pursuit. We could hear him but thankfully he kept to the other side of the riverbed. As I have written in a previous newsletter, I believe that the Black Rhino is more inquisitive than aggressive. In any case, whatever aggression there may be starts with inquisitiveness. We have repeatedly told our guests doing the bush walk to wear neutral-coloured clothing (no bright reds – recall the saying of waving a red rag to a bull) and we encourage them not to wear perfumes and deodorant. 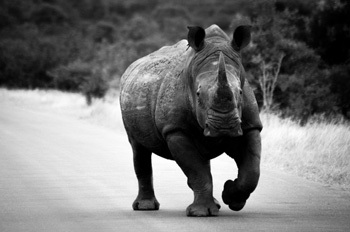 Imagine the poor Black Rhino who has never before smelled Chanel no 5 or Brut. The wind takes this alien and offensive smell to his flared nostrils (recall that Rhino have poor eyesight but excellent smell and hearing) and guess what : of course he will come to investigate what strange smelly manner of animal is on his private turf. As he gets closer he hears voices or sees bright colours and now his inquisitiveness is even further stoked and he comes running ( read charging for those with great imagination ) to see what is going on! We have told our clients to keep quiet on Bush Walks as all animals have a far superior sense of hearing than humans. Most animals (excluding Black Rhino bulls) get away from alien noise and the guests may complain that they see tails of disappearing animals. Notwithstanding the above, I am pleased to report that each and every guest who has done the Big Five Bush Walk has been very happy and has loved it. It is certainly one of our strongest selling points. I am not sure that I agree with Rex’s suggestion to do a pre-walk inspection of those guests who have sprayed themselves too liberally with perfume and deodorant with a view to adding some elephant dung to their clothes !!! On 16th a big Elephant bull tried to get into the Marula Boma to feed on the Marula tree. Everyone got into the vehicles. The elephant blocked the way and started breaking branches. The next day there were branches everywhere – we had to remove them before we prepared our dinner. Viva Safaris, working with two Canadian ladies, Tammy and Virginia, organized a Christmas party for orphans. Trevor from Viva Head Office assisted. We bought the children soccer balls, watches, and toys. Margrett and I joined the party and helped hand out the presents to children. On the 17th we did the Sunset Drive and we found Black Rhino feeding along the road. Near Nonwane we managed to locate two lionesses. In Kruger we saw four of the big five. Union College thereafter visited one of the local villages to meet with local children. We spent the day playing with the kids and helping to plant vegetables and mango trees. Thanks very much to the 2 professors, 12 girls and 8 boys ! It is Marula season and we see many animals such as Monkeys, Impalas, Kudu, Warthogs and Elephants. 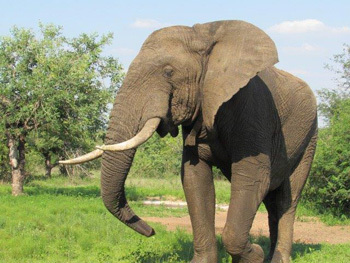 At the lodge we have many Marula trees and the elephants visit us to eat the fruits. While making our way to the walking area, we spotted a Black Rhino sleeping next to the road. During the bushwalk we spotted giraffes, baboons, warthog and one hippo outside the water grazing along the river. On our way back along Olifants main road we spotted two white rhinos taking a mud bath. A group of College students from California came for a safari as well as volunteering work within our local community. 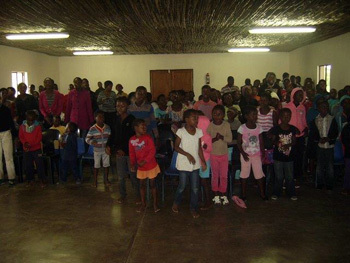 We took them to Acornhoek orphanage home. They played soccer and bought food and stationery for the orphans. Our first sighting was a big herd of elephants feeding along Sable road. We stopped to look at birds and we heard lions roaring nearby. I drove to the area and one of the guests spotted two lionesses walking along the road with cubs. The bushwalk has been very good each day, not only driving to the walking sites have we had amazing sightings, particularly of the Big Five, but also along our walk along the Olifants River. We have had brilliant sightings of hippo and crocodiles every day. On the 11th December I was tracking, on foot, two lionesses and one big male lion. I saw them lying on a donga, fast asleep. This was a magnificent sighting as we were approximately 3 metres away from these beautiful cats! My guests were very happy with this sighting. We also came across a massive herd of buffalo. On the 14th December we came across 2 white rhino bulls enjoying a mud bath. The 18th December produced the best sightings I have had this month! On Nonwane we came across 2 lions. Then we saw a herd of 25 elephants. Near Marula Boma we came across a herd of buffalo. On the 19th of December, it had been raining as we walked along the river. I came across a large hippo that was sleeping under the bushes, a mere 6 metres away from us! I have never before shown guests such a sighting. We have managed to see some very interesting sightings of crocodiles and hippos along the Olifants River. On other occasions we were lucky enough to spot black rhino, lions and elephants. One morning I had parked the vehicle and the guests and I started our walk. We were 30 minutes into the walk when a friend of mine stopped us to let us know that there was a pride of lions surrounding our parked vehicle. We returned to the vehicle and found that the pride of lions were still there. It was an amazing experience! Another recent incident was definitely one for the books! About 20 minutes into the walk, one of the bush walk guides Elvis was about 5 metres ahead of me and we heard something rumbling in the distance. We discovered that Elvis was being charged by a Black Rhino. I told the guests not to run. The Black Rhino eventually stopped the chase and we continued with the walk. In have never before, in 25 years of guiding, seen so many kills in 1 month !!! Approximately 2kms away from Orpen gate I came across 20 Wild Dogs very close to the road. Within 2 minutes, as we were watching an impala cross the road about 25 metres away, 6 wild dogs rushed towards the impala! The impala tried to run away but it was too late! The wild dogs had dragged the impala and killed it. My guests who were speechless were extremely lucky! 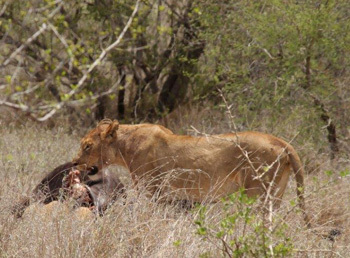 Later that morning, around 9am, 3 lionesses attacked a buffalo. The rest of the herd of buffalo fought back to rescue their friend. One of the lionesses was chased but managed to get away. The herd of buffalos ran away, leaving behind the seriously wounded buffalo. About 7km from Orpen gate, I saw black backed jackals tearing apart a baby impala. The jackals were not too far from the road which gave my guests a really good view of their feast. On the 24th December, along the Satara – Orpen Road we came across a pack of 27 Wild Dogs that were hunting with their 12 pups. Suddenly one started to call and the whole pack started chasing a herd of impalas. A short time later they returned with blood all over their necks. They started to regurgitate some of the food in order to feed the pups. Approximately 500m after S90 from Satara, we came across two buffalo calves wandering around in search of their families. About 500m away were 8 lionesses and one young male. The two buffalo calves were heading towards the pride of lions. 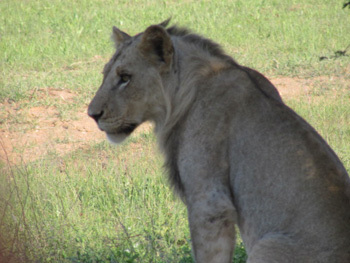 The lionesses moved closer to the buffalo calves. About 50m the lionesses stood up and charged and killed both the buffalo calves. Since the rains have returned to the Kruger, the park has changed from dry to green overnight. With the grass growing, new leaves shooting and the wild flowers blooming the summer has brought an abundance of wildlife activity with it. The insects have returned, the reptiles are out in action, and the herbivores are regaining condition and the predators are having a feast. This is a very exciting time to be visiting the Park to witness the summer changes and its beauty. This month I have had some spectacular days in the park with sightings of some rare and unique animals besides the Big 5 including Honey Badgers, Porcupines, Sable and the cute Elephant Shrew. One day in particular was extremely special to me because we found the Big 7 in one day. This includes Lion, Leopard, Elephant, Buffalo, Rhino + Wild Dog and 2 Cheetah sightings. On 31 December, our day started out with a beautiful healthy breeding herd of elephants of all different ages and sizes. One of the guests spotted a well-camouflaged Leopard on the bank of the riverbed. We parked the vehicle and watched this Leopard for half an hour. At Girivana dam we then found 2 male lions sleeping amongst the bushes. After coming across the usual zebras, giraffes, wildebeest, hippos and more elephants for the rest of the morning, we then ventured before lunch to a Wild Dog sighting. And there they were!!! 8 of them sleeping under a tree in the blistering heat. There are estimated only 300 left in the Kruger National Park. After our lunch break we came across two cheetah brothers underneath a tree resting only 5 metres from the vehicle. They had just eaten so they also were not moving anywhere. We got some great pictures of the two of them bonding. Fortunately we know of a Rhino that holds his territory on a river bend, so we set off in search of this big bull. We witnessed him marking his territory whilst holding poses perfect for photography. Although we had the perfect day in the Kruger we just missed out on seeing the buffalo. We made our way into the gates of Marcs camp, and you wouldn’t believe what was there waiting for us……….. a breeding herd of buffalos! The guests were cheering the whole way back. This day was my first time I have ever got the big 7 in one day! It was the perfect way to end 2014! 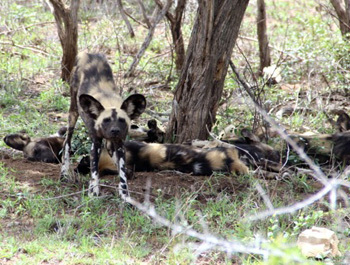 To come across Wild Dog in Kruger National Park is very rare. January has been my VERY lucky month indeed with 5 sightings of Wild Dog. Wild Dogs stretching before the hunt. The most recent sighting of the dogs was on an overcast day when the dogs were hunting Warthog. Although the hunt was not successful, it was great to see these dogs in action. They continued to play around as dogs do, whilst also displaying bonding behaviour through means of licking and rubbing. Another sighting was approximately 40kms away on S39 near the Timbavati picnic spot. This pack of Wild Dog that I have seen all month is 30+ dogs strong. The dogs had made a kill. Wild Dogs are officially on the Endangered Species list. Throughout Africa, currently the numbers of Dogs are estimated at 3000. In the Kruger National Park the current population of Wild Dog is 300. The major threats to the survival of this species include human interference, disease, habitat loss and interspecific competition between other predators. These dogs are very social cooperative breeders, you will find an alpha male and an alpha female of which are the only pair that will breed. Litters come in numbers from 2-20 pups and the whole pack will cooperate to help rear and protect these pups. If you are ever fortunate enough to encounter a Wild Dog sighting, you will forever be amazed at this rather unique species. I am so lucky to have had all these incredible sightings and even so they have been so close together. I very much respect the Wild Dog and I have had the privilege of introducing and educating my guests about them. I really hope the numbers will increase to a healthy population so I can still show my guests wild dog in the years to come. 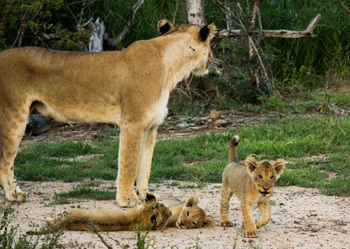 This December has seen the bush truly come alive with sightings of both the plants and animals. There have been so many fantastic sightings that we don’t know which way to turn our heads! This day started with a sighting of a mating pair of lions! We were then met by some beautiful elephants! There was a whole group of babies within the herd and they moved through the bush, following the matriarch. After what seemed like forever of seeing no more than the odd impala or zebra, we were rewarded with a beautiful male white rhino that was crossing the road right in front of the open vehicle. He stopped next to the road, no more than 3m away from us, almost as if to say thank you for being patient! He stood there, allowing us to snap away with our cameras, by which we got some really nice photos of him! I was beyond happy as this was the first time I had ever seen this specific rhino and what a specimen he was! After the excitement of the rhino we visited a few watering holes and got the chance to see some beautiful hippos outside the water, along with a few more elephants coming down to drink! No more than 5km before lunch I had a man flashing his lights at me and pointing frantically backwards…I knew that there was something special there so we sped up again. To our great surprise there were 2 cheetah on a kill!!! Before lunch we had some beautiful bull buffalo sightings, approximately 2km away from Satara. As we were making our way out of the park we saw cars stopped and to our great surprise there was a lioness on the road. That wasn’t the surprise though… as all the cars had moved off I had noticed one female kept looking into the bush and gave a quiet moan, and then from behind the bushes popped 5 babies!!! What a beautiful experience being the only vehicle on the sighting!! It just goes to show that patience pays off! We started with a small breeding herd of buffalo as we got into the park and got some really nice photos of them crossing the road with the males leading the way and the females with their young following behind. We the saw a gathering of cars and in the river bed were 4 beautiful male lions, a dad and his 3 young boys just lounging around. Not more than 200m away around a bend and under a tree stood a huge male rhino with a 1m long horn. Big White Rhino bull on the road staring us down. We had seen 3 of the big 5 less than 1km from one another. On our trip back to Orpen the bush provided 2 more rhino sightings firstly a mother and a calf and then 3 rhinos. The bush also gave us even more elephants with tiny babies right next to the road and even crossing the road no more than 3m away. The once brown leafless Kruger of the dry winter months has rapidly changed into an expanse of endless green. The summer rains have been welcomed with open arms, the water holes which had dried out completely, are now once again filled with water. The black rhino, one of my personal favourites, is always special to see mainly due to its low numbers and it prefers not to be seen, spending most of its time in riverine thickets .My guests and I had the pleasure of spotting two black rhinos moving towards a tasty looking Sjambokpod tree. We sat and watched as they chomped away at the tree, pulling down branches, which were a little too high, while filling their mouths with bits of twigs and leaves. The black rhino always bites through twigs at a 45 degree angle, whereas the white rhino prefers to eat large quantities of grass. Elephant sightings have been superb , large breeding herds have been frequent visitors to different water holes, with the big females often followed by a miniature version of themselves, often coated in mud and full of energy; running around with their little ears flapping. Lions around Satara are big fans of buffalo dinner. With the return of the large herds, we have seen several feasts, in which a big adult buffalo as well as a few young calves have been the victims. One of my best lion sightings involved a buffalo, which had been hunted down in the early hours of the morning, by a pride of seven hungry lions. When we arrived at the scene, the big male lion had finished eating and had found a lovely shady spot, next to the road under a small bush. Alongside him lay two full females, with splatters of bloods still visible around there mouths. When it comes to feeding the lions have a strict hierarchy, the male always gets first choice and will eat until his stomach is full. We sat watching as the youngsters fought amongst themselves, pulling the carcass this way and that, until the big male stood up and with just a look in the direction of the carcass, made the young lions scatter in all directions, truly the king of the Kruger. The Leopard is one of the more beautiful cats in the African bushveld, and an incredibly tricky one to see as they are perfectly designed to remain hidden. To experience one in the wild is something one doesn’t forget easily. We had been sitting watching a big bull elephant, pulling a Marula tree apart with its powerful trunk, it then decided to head straight for our vehicle flapping its massive ears. We seemed to be the cause of its irritation, but then much to our surprise, a leopard appeared from behind the bushes. The elephant decided it wasn’t a problem and continued on its way across the road and disappeared down into the Timbavati River. The leopard however made its way past out vehicle, looked back at us and then continued on its way towards a small herd of impala. The impala reacted immediately to the leopard’s presence and began to snort and chase after the leopard, which casually walked away into the long grass. The drives within Balule, part of the greater Kruger, have provided some close encounters with the Big Five. On an afternoon drive we managed to find three Black Rhinos, sleeping in the shade. The tracks of Black Rhino were evident on the road ahead, along with a pile of dung, most likely from early that morning, it had begun to dry in the heat.. We headed along a very bumpy road, putting the Landcruiser into four by four to negotiate the rough terrain. We were rewarded for our adventurous spirit -just around a corner lying in the shade was not only one but three black rhinos, including young calf. We watched them as they stood up and moved slowly into an open clearing. The big bull decided we weren’t welcome, lowered his head and came charging towards the vehicle. A few “hey stop that’s !! !” and he stopped short of the vehicle, giving us a nasty look and then moved off to join the female with her calf. 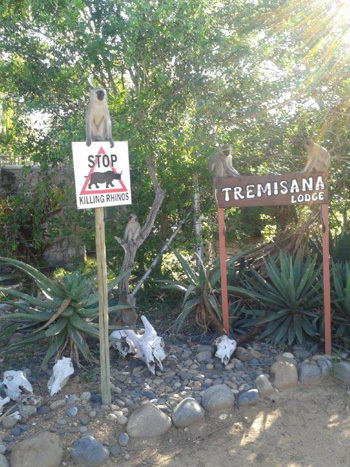 Monkeys at welcoming area of Tremisana Lodge. Marcs Treehouse Lodge has had all wooden balustrades repainted in anticipation of the rains. On the negative side, Jonathan Beretta, Warden of Motlala, reported that in early January 2015 two White Rhino were poached. This has resulted in his deciding to sell the majority of rhino, both Black and White, with immediate effect. Jonathan tells me that he will introduce Elephant within 6 months and some of the lions that have been in quarantine will also be released. This means that Marcs Camp will become a Big Five Lodge. While we welcome the elevated status of our Lodge, it will necessitate a number of alterations and improvements. Imagine a big bull elephant pushing treehouse and tree into the Klaserie River !! We have fortunately had experience with keeping elephants out at our Marula Boma and we will replicate this at Marcs Treehouse Lodge. We don’t want to spoil the beautiful surrounds by adding unsightly electric fences. We shall probably add rings of sharp edged rocks and a low thick wire around each and every treehouse. The tented area will prove more of a challenge. We will also have to employ an armed ranger to accompany guests to and from their lodgings. Our webmaster, Marco Gollino, has produced an absolute gem of our new website – congratulations and our deepest gratitude. The re-launched website, www.vivasafaris.com, offers our clients and travel partners a fresh, brand-new design that is both easy to use and navigate, informative and mobile-friendly. Online payments have been greatly facilitated. Have a look and see whether you like it. Marco has instructed that our guides and managers should sent me snippets of highlights and photos which we will upload twice weekly. In this manner, you will not have to wait for our monthly newsletter to catch up with the latest news at Viva Safaris. With my best wishes for a great 2015!